삼척 신리 일대에 분포하고 있는 너와집과 이집들에 속한 민속유물들을 가리키는 것으로 '너와집'이란 굵은 소나무를 알맞은 크기의 판재로 잘라 기와의 대용으로 지붕에 얹어 만든 집을 말한다. 1970년대초까지 여러 종류의 너와집들이 이 지역에 분포하고 있었으나, 대부분 개조되어 그 자취를 감추었고 현재 문화재로 지정된 집들만 옛 모습을 간직하고 있다. 너와집은 개마고원을 중심으로 함경도, 평안도, 강원도 등의 산간지역과 을릉도 등에 분포하고 있는데 주로 적설량이 많고, 여름과 겨울의 온도차 심한 지방의 산간지역에서 주로 나타난다. 너와집의 평면은 거의 대부분 밭‘전(田)’자 형식의 겹집으로 되어 있는데, 한 채의 집안에 마루, 안방과 사랑방 등의 여러 방과 정지(부엌), 심지어 마구(외양간)까지 들인 폐쇄적인 평면구성을 취하고 있다. 이는 기후 및 외부적 환경의 대응에 따른 결과로, 각 실을 서로 붙여 건물의 외부 노출을 최소화하고 내부에서 발생한 온기(잠열)를 최대한 가두어 극심한 추위를 견디기 위한 목적이며, 마구를 내부에 둔 것은 맹수로부터 가축을 보호하기 위한 목적이다. 세부적인 내부공간의 구성 특징은 집 중심에 있는 대청을 중심으로 왼쪽과 오른쪽 때에 따라 뒤쪽에 안방, 사랑방, 도장방 등을 두고 정지, 봉당, 마구 등을 배치하였다. 봉당은 주로 대청 앞에 위치하는데 집의 내부로 들어가기 위해 출입문을 들어서면 바로 봉당이 되고 이 봉당을 거쳐 각 방과, 정지, 마구로 진입하도록 되어 있다. 봉당은 현대의 주택에서 현관과 같은 역할을 할 뿐만 아니라 실내작업공간으로도 활용되었다. 이외에 민속유물로는 곡식을 찧기 위한 용도의 ‘물레방아’ 및 '통방아', '채독'(항아리처럼 싸리로 엮어 만든 저장용구), '김치통'(김치등을 담아두던 나무로 만든 통), '설피'(눈이 쌓였을 때 짚신위에 덧신어 다니기 편리하게 만든 것), '창', '주루막'(새끼 따위로 촘촘히 엮어 멜끈을 달아 물건을 나르는데 씀) 등이 있다. 이 지역의 너와집들은 우리나라 강원도 산간지역의 너와집 유형과 발달과정을 연구하는데 귀중한 자료로 평가받고 있다. 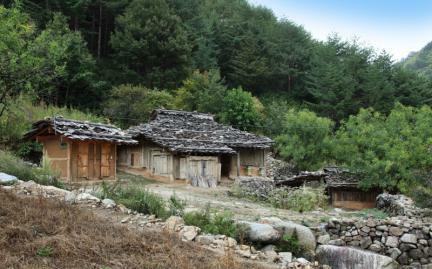 These shingled houses and folk artifacts were owned by Kang Bong-mun, Kim Jin-ho, and Yun Yeong-won. 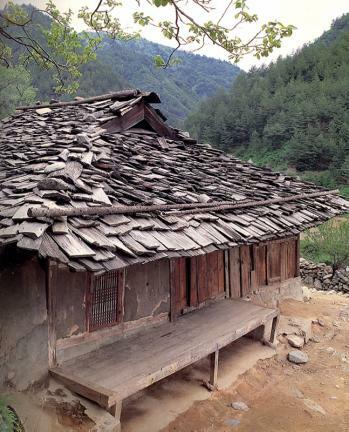 A shingled house refers to a house whose roof is made of the thick, unfinished shingle of pine tree bark. Such houses used to be common until the early 1970s; now, however, most of them have been renovated; only a few have preserved their original shape after being designated as cultural heritage by law. Kang Bong-mun’s house faces southwest and has a treadmill site on the east side. It also has a “magpie hole” on the roof to let out smoke from the heating system of the house. 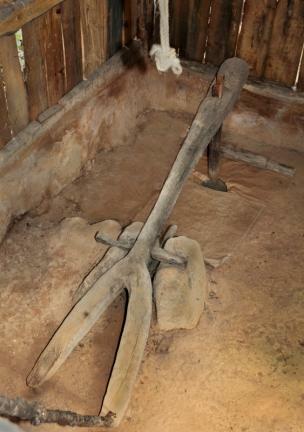 The gate wing in the front center has a cowshed on the left and a kitchen on the right. Inside the premises, the house has a main room and a guest room on its left and right sides, respectively. 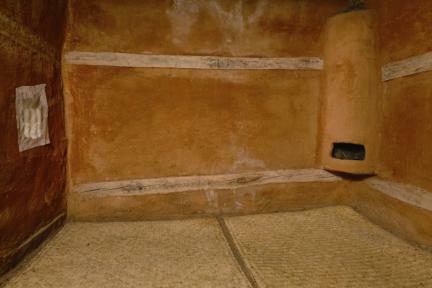 A unique stove or “cockle,” designed to heat and light up a space, is placed at the corner of the main room. 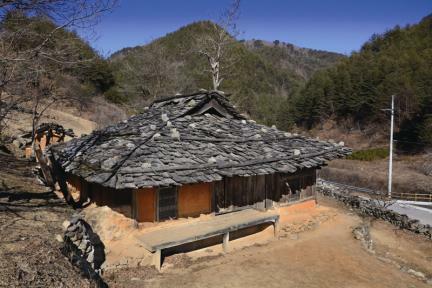 Kim Jin-ho’s house faces the west and also has a “magpie hole” on the roof. 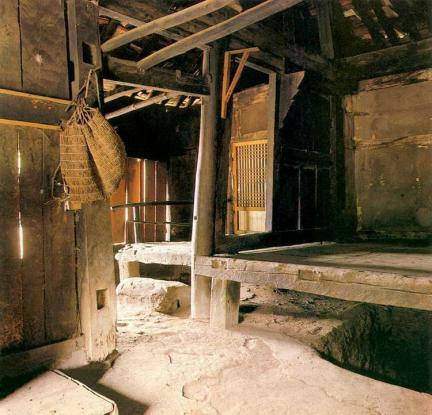 The gate quarters of the house have a cowshed on the left and a kitchen on the right. 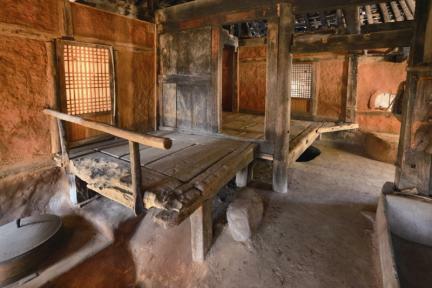 The main house has a wood-floored hall in the middle, a guest room on the left of the wood-floored hall, and a main room on the right connected to the kitchen. The bedroom has a “cockle” on one corner. 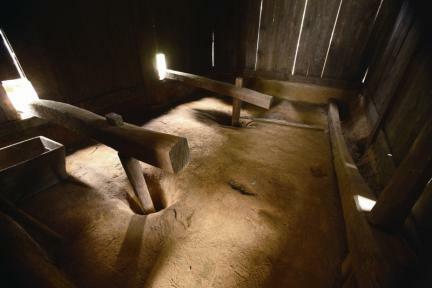 A fire-seed repository is placed on one corner of the space between the kitchen and the cowshed for convenience of housework. 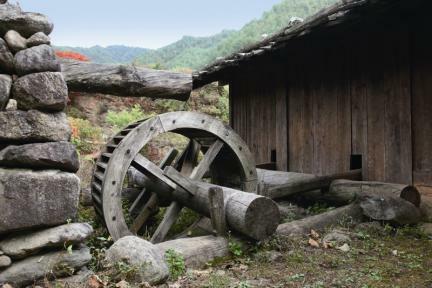 Diverse cultural remains such as water mills, wicker jar, wooden kimchi storage container, snowshoes, spear, and net bag are considered valuable resources, along with shingled houses, in studying the folk life and traditional housing of the Gangwon-do area.